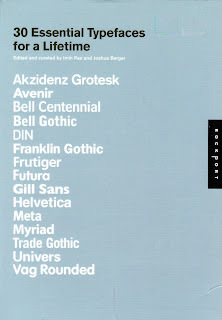 My bro recently blogged about the book 30 Essential Typefaces for A Lifetime which is a survey of 30 important typefaces. Sans-serifs: Akzidenz Grotesk, Avenir, Bell Centennial, Bell Gothic, DIN, Franklin Gothic, Frutiger, Futura, Gill Sans, Helvetica, Meta, Myriad, Trade Gothic, Univers and Vag Rounded. Serifs: Adobe Caslon, Adobe Garamond, Bembo, Bodoni, Clarendon, Courier, Excelsior, Lucida, Minion, Perpetua, Sabon, Stempel Schneidler, Times New Roman, Trajan and Walbaum. I hope you have more of these gems than I do. posted by Jonathan at 10/24/2009 11:00:00 p.m.
Futura, Times New Roman, Courier, Lucida (Sans), Myriad, Trajan, Adobe Garamond & Caslon, Bell Gothic. Most of these were installed with Photoshop or Windows. I still have to find a decent Helvetica that works on Windows with ClearType..
By John, at 10/25/2009 12:45 a.m.
By Jonathan, at 10/25/2009 12:56 a.m. I have even less than you (7). Futura, Gill Sans, Helvetica, Bodoni, Courier, Lucida, Times New Roman. I think the reason for this is that we are web people and the web doesn't really do fonts. That could change. The last year or so has seen @font-face support from several browsers, although the IE implementation remains different to the others. By Thomas David Baker, at 10/28/2009 11:00 p.m.
Actually my brother bought some Adobe design software and got a *ton* of fonts—whole bunch of Helvetica weights, for example. And Trajan. And dozens of other really good Adobe ones. By Jonathan, at 10/28/2009 11:08 p.m.